Take A Ride Through My Mind..! : There Is Another Door..! I was just reading a newspaper, when a topic caught my attention. A columnist wrote about the great women in world. 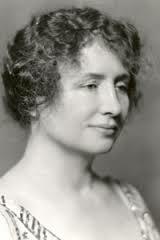 And when we talk about great women, how can Helen Keller be any far, Right? Helen Keller is an institution of inspiration in herself who though having many physical disabilities achieved so much in life. And we, being physically stable are mentally unstable. God has given many of us everything but we still have qualms about something or the other. If we fail, we get depressed; relationship doesn’t work out, we start counting faults; if we can’t afford iPhone, we touch the heights of cursing almighty for making us born in middle class family; there is always something or the other to cry about. So, I’ve made a point of not staring at the closed door (past) & look around for that another opened door. This isn’t a one day promise & nor yours should be. Because if today someone breaks your heart, there is someone perfect waiting for you and if you don’t get what you want; you’ll get something much better later. Do think over it & leave a comment.